Well as the car will be used for off roading at times we decided to make some rock sliders like we had fitted to the car before the rebuild. We were unable to re use the originals as fitting involved a big sledge hammer to knock one of the fixings in to the rear tubular outrigger. This time round we got hold of some 80 x 40 3 mm box section, measured the lengths between wheel arches and cut to length. The fixing for the sliders were to be the tubular outrigger at the back and the bulkhead at the front. So with some handy extra bits of pipe and 80 mm angle we made the mounting plates and clamped up the sliders, tacking them all together before removing from the car and welding fully. Handily at the time dads work were prepping a job for galvanizing and the bosses kindly let us put the sliders in with that. On Friday i got a phone call saying that the sliders had been returned and looked good, so a small job for the weekend was fitting them, also swapping the bolts in the bulkhead over. As Saturday was a nice sunny day it took all of about 30 minutes to fit them and it looks great, we just need to modify the wheel arch eyebrows to fit correctly. 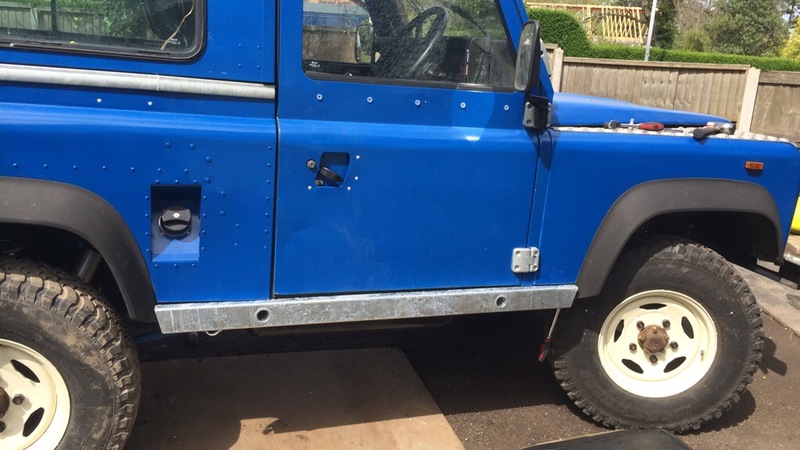 This entry was posted in Bodywork and tagged 1983 Ninety, bodywork, galvanised, home made, Land Rover, Parts, Progress, rebuild, Wirral on April 28, 2014 by landyrebuilds. They look great and once again I’m in awe of your skills. Thanks, its now at the point where i can’t believe its going back on the road on Thursday, the first time in 3 years. Going to be strange being a daily drive again. I have a small list of bits that need looking at in the near future to make things better that will be published in a post shortly.